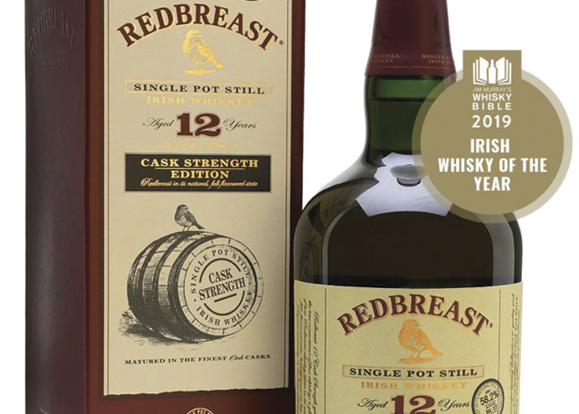 Redbreast Aged 12 year Cask Strength, Jim Murray's 2019 Irish Whisky of the Year. The best Irish whiskeys of 2019 have been revealed in news that’s sure to make essential reading for dram drinkers everywhere. Scotch may go down well with some, but over in Ireland, it’s got to be whiskey every time. But, away from the usual array of Jamesons and the like, the question remains: what constitutes the best dram on offer from the Emerald Isle? Thankfully world-renowned whiskey critic Jim Murray knows the answer. He’s been sampling the finest whiskeys on the planet for much of the past 15 years and knows a thing or two about what constitutes the very finest on offer. Each year they are included in Murray’s annual Whisky Bible. He sampled well over 4,600 spirits for the latest edition of his popular tome to reach his conclusions.